So the first month or so with your little person is exhausting. There is not much time for anything but feeding, diaper changes, laundry, and if you're lucky napping. However, when your little one starts to be awake more you find yourself staring at them wondering what you are going to do with them. When they are awake longer and ready for some stimulation it is time for play and toys. I have a Mama confession, we didn't really have any toys for our son when he was born. We had some stuffed animals, and of course books...but one of the things we didn't get at the baby shower were toys. My son was born right before Christmas so Santa brought a couple of fun things but for the most part we didn't have much for him. This lack of baby entertainment became a much bigger issue when my husband went back to work and I was at home, alone, with the baby. I soon found myself confronting the infant toy section and I was a little lost...There wasn't all that much being offered in the 0-3 months range either. What would he find amusing and what would also be stimulating? What toys would grow with him and be his friends longer than a couple of months? 1. How long is he going to be able to play with this toy? Is he going to out grow it quickly or will it grow with him and provide multiple months of fun? 2. What types of stimulation does this toy provide? Not all toys are as stimulating as others. Play time should be fun but it should also be educational. 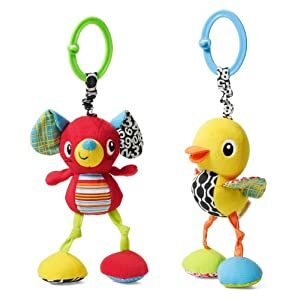 Does this toy have lots of colors (sight), textures (touch), make noise (hearing), require manipulation (cause and effect, hand eye cordination)? 3. Can I/ How do I clean this toy? Babies slobber, they spit up, and yes...poop happens....Can I sanitize this toy they way it should be sanitized? Can I put it in the washing machine or dishwasher? 4. How easy is this toy to transport? Is it easy to throw in the diaper bag or car to take with us? 5. How easy is this toy to store? Can I throw it in a basket or fold it up in a closet? 6. Is the cost of this toy equitable with the amount of time it can be used? Does it require batteries? What I found in my research is that many baby toys look great but when put to the test they just don't make sense financially. It also baffles me how many baby toys are difficult to clean. There are a few toys that I found simply by having my son in the store with me and seeing if I got a positive reaction from him when I presented it to him. Now if you have time I also suggest reading parent reviews of products before you buy. Sometimes, not always, someone will mention a negative aspect of the toy that you did not consider or that would not work for you. *The toy name is a link to the toy in Amazon. Sassy Wrist/Ankle Rattles: This toy helps the baby become aware of their feet and hands. The noise catches their attention through hearing and the image captures their sight. Although this toy is said to be for the wrists I have put them around my sons ankles when he is in his car seat to entertain him. He likes hearing them when he kicks. Jittery Bird by Infantino: This toy has lots of texture and color. It also vibrates when it is pulled down from the ring. When my son was smaller he liked to watch the feet dangle. Now that he is older he likes chewing on the feet and legs. The wings are also filled with crinkle material that my son likes to play with. He also gets a big kick out of the vibrating and this particular feature has been good when he has need a distraction. 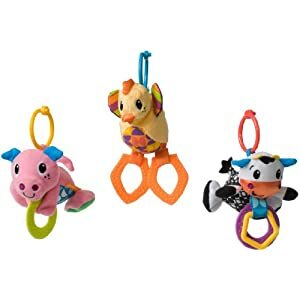 Infantino Barn Babies Teething Toy: I personally love this toy and the noise it makes. My son loves the noise as well and has gotten many smiles and giggles. The teething rings on the feet of the toy make it a great transitional toy. It also different textures and many colors. My son really enjoys exploring this toy (it too has crinkle material in the arms) and it is also great for redirecting behavior and attention. 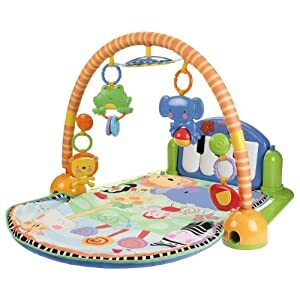 Tummy Time/Back Time Activity Center by Fisher Price: There are a lot of tummy time and activity mats out there. They also range greatly in price. I chose this mat because the piano will flip up when my son is able to sit up and play. The toys (except the mirror) come off so that you can take them along. My son loves kicking the piano both on his tummy and on his back. When he is bored with tummy time I can flip the overhead activity bar down so that he has the toys on the floor with him and he can still see himself in the mirror. The mat is also machine washable. This mat had the greatest longevity of the mats I looked at and has been very entertaining for my son. 1-2-3 Crawl Snail by Fisher Price: This is a very fun toy! 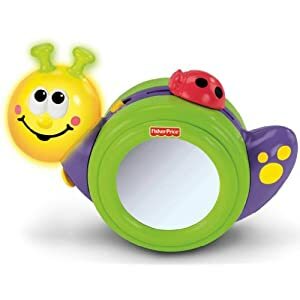 When my son is doing tummy time he is able to see himself in the mirror and when the snail is bumped (even gently) the face lights up and it starts to sing. This toy give baby a lot of incentive to reach out and touch it encouraging both hand eye coordination and crawling. When the snail is tapped from the front or back it rolls away. This makes my son giggle and positively challenges him to go after it! 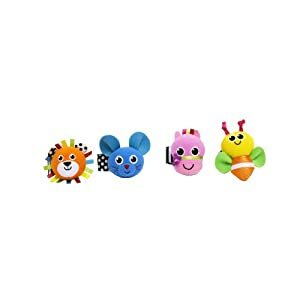 Nuby Teethers: The teethers are marked to be for 6 months plus, however, my son started having a chewing need at 3 months. At 4 months I found these and let him give them a try. You be the judge of weather of not your child is ready for them earlier than what is suggested on the package. There are a couple great features about these theethers. One of the best features is that they come in a plastic carrying case to help keep it clean. They offer multiple textures for chewing and two different thicknesses (the yellow is softer and the orange harder) for chewing stimulation. The hand shaped one is great I am able to replace my sons hand for the toy! They are easy to hold and the ring allows me to put a leash on it so that we do not loose it!!! They were inexpensive and so far well worth it!!! 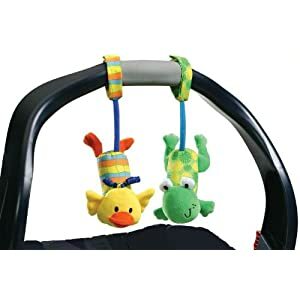 Infantino Tag Along Chimes: I discovered these while trying to entertain my son at Toys R' Us while waiting for a employee to find the product listed below. He liked these the best of all the chimes and I must say that I agree with him. He really enjoys the chime sound they make and my husband had used the velcro feature to attach the chime to my sons wrist..oh the things that happen when Mama leaves the baby with Daddy....my son still loved them. I have also attached them to the pegs of the head rest on the seat and they dangle and chime while I drive. I do not attach them to the baby carrier if we are in the car because this is hazardous in case of an accident! These are one of my greatest finds and I will replace them immediately if they ever get lost! 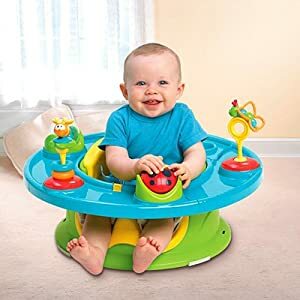 Summer Infant Super Seat: This seat is awesome! This is a toy that truly grows with the child. It helps baby learn to sit up on their own and provides great support for them when they are still a little weak on their own. The toys are stimulating and engaging. it is easy to clean plastic and foam. There is a foam liner inside the seat for when baby is smaller and the liner pulls out when baby is bigger. When baby is ready to sit at the table the ring detaches and the straps to your dinning room table chair and becomes a booster seat!! !